St. Brigid is closely associated with St. Patrick. It is said that she was baptized by Patrick and developed a close friendship with him. As a young girl, Brigid felt called to be a nun. At this time, women who took vows of chastity remained at home with their families. 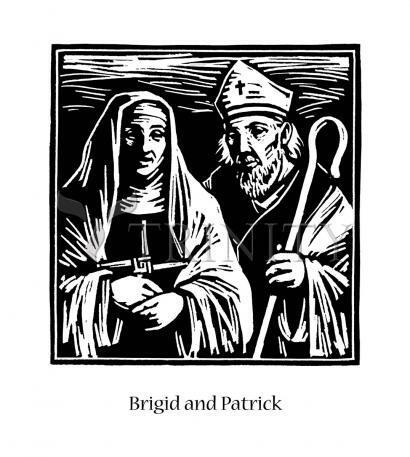 Brigid knew about Patrick’s monasteries, however, and decided to begin a community of her own where people pursuing a religious life could live together. In Kildare, Brigid began a monastery that was soon opened to both men and women. Like Patrick, those associated with the monastery helped to spread Christianity throughout all of Ireland. —ND Vision, University of Notre DameIreland, ca. 450-525 and 389-461. Their feast days are February 1 and March 17. Daughter of Dubtach, pagan Scottish king of Leinster, and Brocca, a Christian Pictish slave who had been baptized by St. Patrick. Just before Brigid's birth, her mother was sold to a Druid landowner. Brigid remained with her mother till she was old enough to serve her legal owner Dubtach, her father. She grew up marked by her high spirits and tender heart, and as a child, she heard St. Patrick preach, which she never forgot. She could not bear to see anyone hungry or cold, and to help them, often gave away things that were Dubtach's. When Dubtach protested, she replied that "Christ dwelt in every creature". Dubtach tried to sell her to the King of Leinster, and while they bargained, she gave a treasured sword of her father's to a leper. Dubtach was about to strike her when Brigid explained she had given the sword to God through the leper, because of its great value. The King, a Christian, forbade Dubtach to strike her, saying "Her merit before God is greater than ours". Dubtach solved this domestic problem by giving Brigid her freedom. Brigid's aged mother was in charge of her master's dairy. Brigid took charge ,and often gave away the produce. But the dairy prospered under her (hence her patronage of milk maids, dairy workers, cattle, etc. ), and the Druid freed Brigid's mother. Brigid returned to her father, who arranged a marriage for her with a young bard. Bride refused, and to keep her virginity, went to Bishop Mel, a pupil of St. Patrick's, and took her first vows. Legend says that she prayed that her beauty be taken from her so no one would seek her hand in marriage; her prayer was granted, and she regained her beauty only after making her vows. Another tale says that when St. Patrick heard her final vows, he mistakenly used the form for ordaining priests. When told of it he replied, "So be it, my son, she is destined for great things." Her first convent started with seven nuns. At the invitation of bishops, she started convents all over Ireland. She was a great traveller, especially considering the conditions of the time, which led to her patronage of travellers, sailors, etc. Brigid invented the double monastery, the monastery of Kildare on the Liffey being for both monks and nuns. Combeth, noted for his skill in metalwork, became its first bishop; this connection and the installation of a bell that lasted over 1000 years apparently led to her patronage of blacksmiths and those in related fields.